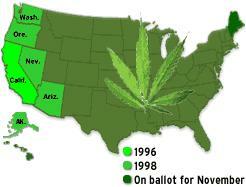 State's where marijuana is legal medically ! Alaska , Hawaii, Maine and the Dist of Columbia. We all see the "DRUG WAR PROPAGANDA" of today presented by idiots at the "Partnership for a drug free america" (like that's really gonna happen) and of course those brian scientists at the ONCDP ("Drug Czars office"). Who spend 18 billion a year trying to accomplish something something that's impossible because "millions of Americans (like me) want certain DRUGS!!!" "NJWEEDMAN", please answer the following questions? 1 Q: What is marijuana? A: "Marijuana" refers to dried flowers and leaves of some strains of the cannabis hemp plant, which contains various quantities of the non-narcotic chemical THC (tetrahydrocannibinol) in various quantities. When smoked or eaten, it produces the feeling of being "high," which lasts a few hours. Different strains of this herb produce their own sensual effects, ranging from sedative to stimulant. 2 Q: Who uses marijuana? A: There is no simple profile of a typical marijuana user. It's been used for thousands years for medical, social, and religious reasons as well as for relaxation. Severa American Presidents farmed hemp and cannabis, and some are believed to have smoked it. One out of every five Americans in all walks of life say they have tried it, and it is still very popular. 3. Q: How long have people been using marijuana? A: Since Biblical times. This practice was widely accepted in Canada and the US, as well, until the orchestrated campaign of the 1930s led to disinformation, public hysteria, and the first laws against using it. 4. Q: Is marijuana addictive? A: No, it is not. Most users are moderate consumers who only smoke it socially occasionally to relax. We now know that 10% of our population have "addiction personalities," and they are no more nor less likely to abuse cannabis than anything else. 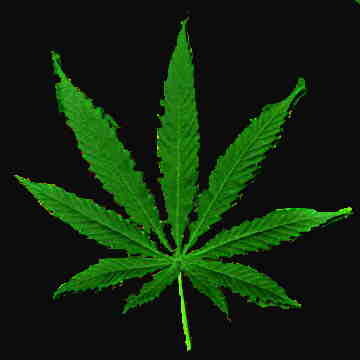 On a relative scale, marijuana is less habit-forming than either sugar or chocolate. Sociologists report a general pattern of marijuana usage that peaks in the early adult years, followed by a period of leveling off, and finally a gradual reduction in use. 5. Q: Has anyone ever died from smoking marijuana? A: No; not even once. American Judge Francis Young studied all the evidence in 198 and ruled that "marijuana is far safer than many foods we commonly consume." The federal agency NIDA says that autopsies show 75 people per year are high on marijuana when they die, but this does not mean marijuana is a factor in any of their deaths. 6. Q: Does it lead to hard drugs? A: No. Although people who abuse drugs often smoke marijuana also, the National Academy of Science reports that "legal drugs for adults, such as alcohol and tobacco, ...precede the use of all illicit drugs." "Tobacco is known as the gateway drug." 7. Q: Does It Cause Violence? A: No, just the opposite. The only crime most marijuana users commit is using marijuana. The U. S. Shafer Commission report was the most comprehensive study ever undertaken on the subject. It found that marijuana smokers "tend to be under represented" in violence and in crime, especially when compared to users of alcohol, amphetamines and barbiturates. "The simple fact is that marijuana does not change your basic personality." The American federal government reports that over 70 million Americans have smoked it ... probably including some of the nicest people you know. 8. Q: How Does Marijuana Affect Your Health? glaucoma to asthma to cancer therapy, to AIDS, and more. 9. Q: What About All Those Scary Stories and Reports? A: Most sensational claims of health risks cite no studies or sources at all. Others rely on a handful of inconclusive or flawed reports. After 20 years of study, the California Attorney General's panel, concluded in 1989 that "an objective consideration shows that marijuana is responsible for less damage to the individual and society than alcohol and cigarettes." 10. Q: What Should We Do? A: American and Canadian taxpayers have funded many studies on this very point, and every independent government panel on marijuana has opposed the jailing of marijuana smokers. The Canadian Police Chiefs Association are even fighting for Decriminalization. Most have urged lawmakers to re-legalize and tax use of this herb by responsible adults, with age limits and regulations like those on alcohol and tobacco. Tell your elected leaders to free up our police and resources to combat violent crime and to honor our national pledge and commitment to "liberty and justice for all" by ending marijuana prohibition. The worst thing about "marijuana Prohibition is what the Government does to you when your caught!